30 Luxurious and 3 Suite Room with Modern Style Bathroom. Well Equipped Room Amenities, Tea Coffee Maker, Free WI-FI, Mini Bar, Multi Cuisine Fine Dinning Hall. 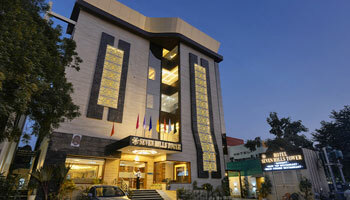 Roof Top Chinese & Mughlai Speciality Bar B Que Frontier Restaurant, 24 Hr Room Service. Banquet Hall for Conferences & Social Functions. Doctor on call, Travel Desk & Same Day Laundry Service. Secretarial Services, Exhibit Space, Doctor on Call, Spa/Massage/Wellness, Baggage Storage on Request, Laundry Facilities, Breakfast Services, Gardens, Travel Counter, Gift Shops/News Stand. Internet Access, Air Conditioning Room, Minibar, Desk, Refrigerator Room, Slippers, Moisturiser, Hair Dryer, Television Room, Smoking Rooms.